On March 29 at Eastern High School, Kylee Tolliver, seated second from right, signed her National Letter of Intent to join the Wheeling Jesuit women’s golf team. TUPPERS PLAINS, Ohio — Swapping one birdie for another. 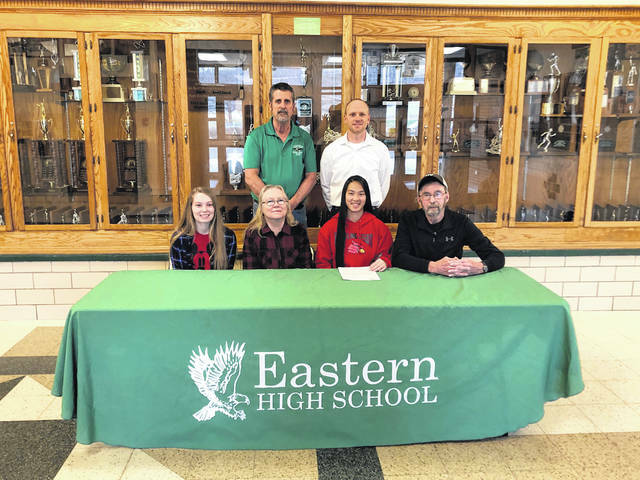 On March 29 at Eastern High School, senior Kylee Tolliver signed her National Letter of Intent to join the Wheeling Jesuit University Cardinals golf team. Tolliver — a three-year golfer for Eastern — talked about the opportunity to play in college, and thanked those who have helped her reach this point. “It’s an honor, honestly. I just thank God for allowing me to have this opportunity to play for Coach Sue Vail,” Tolliver said. “She’s an amazing woman, and I want to thank her for allowing me to play for her. I want to give big thanks to the West Union High School coach, he was the one who told her about me. As a sophomore, Tolliver led the fourth-place Lady Eagles at the Division II sectional tournament, and received a second-team all-district nod. The following year, Tolliver was again named to the all-district second team, while moving on from sectionals as an individual. 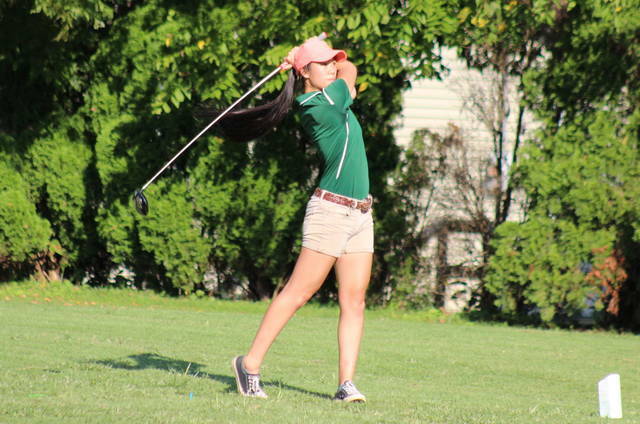 She was 12th in the girls Division II district tournament as junior. As a senior, Kylee played with the EHS boys squad, earning all-league honors and helping the Eagles claim a share of the Tri-Valley Conference Hocking Division title. Tolliver helped Eastern claimed runner-up honors in the Division III sectional and place fifth in the district. Eastern head coach Bill Salyer — who was named TVC Hocking Coach of the Year in his first season with the squad last fall — talked about Kylee’s signing and the possible advantages she has after playing a year with the boys varsity squad. “Everyone is thrilled for her,” Salyer said. “Certainly Wheeling Jesuit’s gain is our loss, but she was going to go somewhere. She’s an awfully nice young lady, an awfully good athlete and a hard worker, so I have no doubt they’ll be thrilled with her. WJU is a NCAA Division II school, that competes in the Mountain East Conference. Tolliver — who has also competed on the EHS track and field team for two seasons and holds a 3.6 grade-point average — talked about what she’s looking forward to once she joins the Cardinals. Tolliver will major in pre-med at Wheeling Jesuit University.